When Gems of Geometry arrived through the post it seemed the Gods had conspired to despatch the perfect book for me to review. Like the author, John Barnes, I have a fascination with Edwin Abbot Abbot’s Flatland and spent many childhood hours gluing paper models of fantastical geometric constructions together. Not only that, mine and Barnes' paths had also crossed in a former life, when I once shared an office with the commissioning editor for his best-selling computer programming books. So, would the author of successful student textbooks in one field, be able to apply his magic to a popular mathematical treatise? At first glance the content is fairly standard stuff: we learn about the golden ratio, explore Platonic and Archimedian shapes and solids in two and three dimensions and dabble in four-dimensional figures, projective geometry, topology, chaos, fractals and relativity. What's not so standard is the stuff you find out along the way. 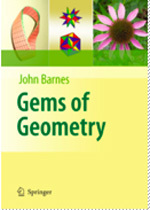 Barnes, as it turns out, is a geometry geek. And, as with all geeks, when he's talking about his pet subject you can't help but be inspired by his quirky, endearing and infectious enthusiasm, even if he occasionally veers off topic. Throughout, Barnes refers to physical manifestations of the mathematical concepts, whether it's Meccano structures, the buds of sunflowers, cacti and pineapples or some elderly paper models of his own making. These help to bring new perspectives to even the most familiar of shapes. For instance, imagine a solid cube. What shape would you see if you sliced diagonally through its centre? What solid would you make if you joined the midpoints of its faces? And what relationship does this have with the form created by joining the midpoints of an octahedron's faces? If you'd like to try it out yourself, you'll find the answers below. Barnes also considers common artistic and literary interpretations of geometric figures, regularly citing the work of Escher and Dali, and talking about the stories of Charles Dodgson (a.k.a Lewis Carroll), William Upton and Robert Heinlein. In the latter's And he built a crooked house a couple's new dream home folds up into a hypercube (the four-dimensional analogue of a square) after an earthquake. If the couple attempt to go out of the window of the master bedroom above the kitchen, they end up falling into the kitchen from the ceiling. If they leave the kitchen by the window opposite, they enter the study by the corresponding window, upside down. And when they go out onto the roof of the study they end up in the basement. Sheer havoc. This fascination with stories and books isn't limited to the main text. Each chapter ends with a detailed description of recommended further reading, which led me to add a number of titles to my Amazon wish list. Who knew about Robin Wilson's Stamping through mathematics, which collects together almost 400 images of postage stamps depicting aspects of maths? (Plus, it seems, did — read the review here.) Or Soap Bubbles, published in 1890? Its author, Sir Charles Vernon Boys, was known for entertaining Victorian dinner parties with his soap bubble demonstrations. There are also regular pauses for discussion of the curious etymology of mathematical terms. Barnes shares the Greek and Latin derivations of seemingly familiar words like corollary (from the Latin corollarium, a garland of flowers given to an actor as a gift, indicating that a corollary comes for free with no further effort) and concurrent (from the Latin con — together — and curro — I run). He also makes a point of stating the proper name for a regular nine-sided polygon as enneagon (from the Greek for nine, ennea) alongside the more common Latin prefix version, nonagon. And if you look carefully, you'll even find a nod towards Old Norse — used to describe a solid with 12 pentagonal faces and 80 triangular ones. All these disparate topics aren't just interesting asides. To some extent they reinforce Barnes' belief in the beauty of geometry itself, which he considers demonstrated by the occasions when "seemingly unrelated topics suddenly have a deep resonance". Sharing this beauty — and the sometimes surprising nature of geometry — is just one of the book's objectives, though. Barnes is also keen to show that, despite living in a three-dimensional world, our understanding of three dimensions is fairly poor. So, in answering the questions above, did you realise that a diagonal cut through a cube produces a hexagonal shape? Or that joining the midpoints of its faces produces an octahedron? And that doing the same for an octahedron produces a cube — making the two shapes dual? I certainly didn't. The book's other key aim is to stress that solving and understanding a problem depends very much upon getting the right point of view, whether that's considering the location of a clock-watching observer in a special relativity experiment or using projective geometry and inverse transformation to prove Steiner's porism about circles within circles. There's even a chapter dedicated to four dimensions, where Abbot's Flatland is invoked to encourage us to imagine what we would see if four-dimensional figures were to pass through our very own "spaceland". If all this sounds a bit too complex, you should be able to get through most of the book without much mathematics. But if it's just the gems and beauty you are after, you won't be disappointed. The book is illustrated with vibrant colour figures, some produced in stereo (you'll need to hold a piece of paper between the printed images and focus into the distance in order to appreciate the full effect). And there are plenty of exercises and suggestions which encourage you to make or colour in shapes and patterns (just another example of how Barnes taps into that childish fascination with geometry for geometry's sake). My only quibble is that, having invested in glossy paper and colourful illustrations, the publisher might have gone one step further, to lay out the book in a more imaginative style. For me, the rather academic page design undermines the work's key selling point: the author's passion (verging on obsession). And unlike your average student textbook, this is a book designed to be dipped into, explored, enjoyed and savoured. Anna Faherty read physics at Cambridge before working in publishing for fifteen years. She commissioned the Modular Mathematics Series and worked on 50 mathematical ideas you really need to know. Anna is now a freelance writer and consultant working with a diverse range of clients including the Science Museum, the National Maritime Museum and Time Out London Guides. She also lectures in the School of Journalism and Publishing at Kingston University, London. For what it's worth, using a recent Chrome browser, I don't see either of the links you mention for purchasing the book. Purchase Links - browser version? Sorry the links aren't working for you - they are fine on Chrome for Mac (version 10 and 11) Chrome on XP and Chrome OS. I think you might have inspired me to get it!